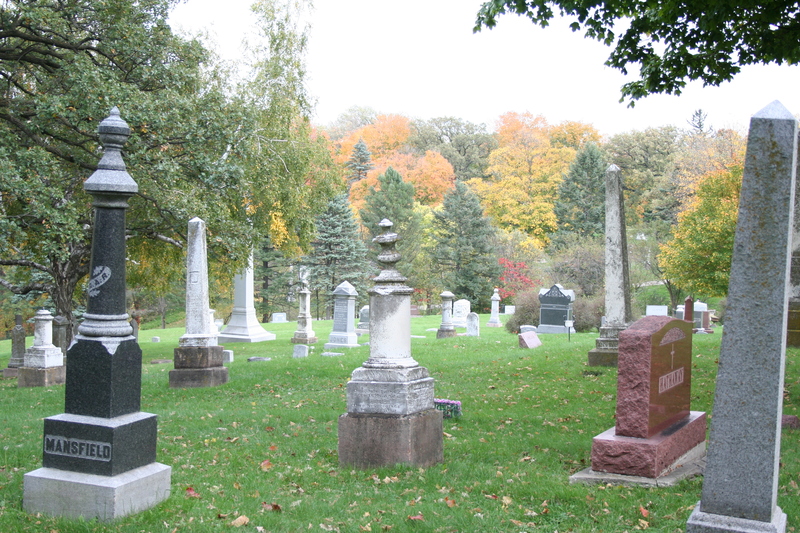 Glenwood Cemetery, Mankato, Minn. Photo by author. Occasionally I’ll be trolling the Web to bring you national and international stories that relate to cemeteries, funerals, etc. If the stories pique my interest, I hope you might find them noteworthy, too. One man has chosen to walk through nine cemeteries in the Conway, Mass., area and document every person who has died since 1952. And not just list their names; he’s going to research the person’s history and find the cause of death. Why since 1952? Because in 1951-52, a Mrs. Max Lederer documented everyone who was buried in Conway. Her list is 218 pages long. It’s not clear if Mrs. Lederer died or simply gave up. Maybe her hand became paralyzed after writing 218 pages. In any case the list hasn’t been updated for 60 years. Peter, I hear ya. He should come to Waseca. I think he’d enjoy the stories that arise from those cemeteries, too. I’ve traipsed through several cemeteries collecting genealogical information on my familly and taking pictures of the stones to document the facts. You’ll be interested to know that our ancestor, Christian Hanel, was born and died on a variety of days depending on which record you look at! Sometimes the records depend on the memory of the person supplying the information. I’ve even been known to write a birth date that occurred after the death date! I’m so grateful to the people who want to go through the cemeteries to record information! I think it’s important to have that written down in one place, even if the dates can be conflicting. You’ve shared some beautiful stories about those resting in the Waseca cemeteries, Rachael. Stories that I’ll never, ever forget. Thanks, Amy! Those stories are in every cemetery. What an interesting idea. I think it’s similar to my interest in genealogy, such as discovering by the dates that my great grandfather’s 2 little sisters died at Christmas time when he was only five. How that must have changed his life! Right away in the first chapter of my memoir I write about how gravestones are much more than just letters and numbers. Put them together and they will start to tell stories, just like the one you mention. Have you ever tried to write a story from your great-grandfather’s perspective? I agree that would be such a sad, life-changing event.